Japanese researchers have determined that “honokiol” and “magnolol”, (two chemicals found in Magnolia Bark), are up to 1000 times more potent than Vitamin E in antioxidant activity. These two active compounds are thought to contribute to the primary anti-stress and cortisol-balancing effects of the plant. Honokiol acts as an anti-stress agent at lower doses. 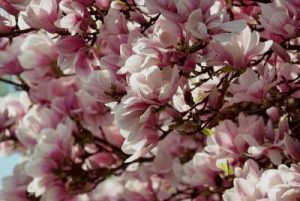 Magnolol, a compound isolated from the cortex of magnolia , has been found to possess anti-allergic and anti-asthmatic activity. Main Actions: Anti-allergic, anti-asthmatic, anti-bacterial, anti-fungal, anti-septic, anti-spasmodic, anti-stress, anxiolytic, aphrodisiac, appetiser, digestive, diuretic, emmenagogue, expectorant, ophthalmic, stomachic, tonic, warming. Weight loss – Magnolia bark is known for its “cortisol” effect – the stress hormone-lowering supplement. Cortisol is associated with weight gain (particularly fat in the abdominal area), sugar control problems, memory problems, and a host of other stress induced disorders. Anxiety – Studies have shown that honokiol was compared with diazepam (Valium), a well known pharmaceutical anxiolytic. Honokiol was found to be five times stronger than diazepam in reducing anxiety without the side effects of diazepam. Although diazepam does reduce anxiety, it also induces muscle relaxation, an effect not shared by honokiol. It seems that honokiol is less likely than diazepam to induce physical dependence, central nervous system depression, motor nerve disruption, or amnesia at doses eliciting the anxiolytic effect. As honokiol reduces anxiety without disruption of motor activity, it is said that the mechanism of the anxiolytic effect of honokiol is at least partially different from that of diazepam. Alzheimers Disease – Magnolia has several powerful effects on acetylcholine levels in the brain, offering potential benefits for victims of Alzheimer’s Disease. Alzeimer’s Disease is characterised by insufficient levels of acetylcholine, accompanied by the buildup of amyloid plaque in the brain, disrupting normal brain functioning. Asthma – Magnolol was found in studies to support the body’s natural production of adrenal steroids (corticosteroids) which suppress inflammation. This anti-inflammatory effect is thought responsible for alleviating the allergic inflammatory response in cases of asthma. Increases in corticosteroids may be a concern for those wishing to use magnolia as a weight loss product, but in a patented product combining the herb with phellodendron this effect was reversed, resulting in corticosteroid reduction, and reduced cortisol-induced food cravings. Should not be used by pregnant or lactating women or those suffering from dehydration. Should be avoided in people suffering from severe kidney or liver disease. Large doses may cause vertigo. Magnolia Bark contains turbocurarine and related substances which are known to cause respiratory paralysis in animals and may be toxic to infants and small children, even when used as directed.